Hungarian beauty care is legendary. Here, exclusive skin care products have a long history. Divas and royalty traveled from across Europe to indulge in Hungarian skin care techniques and exclusive thermal springs to rejuvenate their skin, minds and bodies. The spa culture was born out of the desire of the beautiful people of Europe to maintain their radiance. 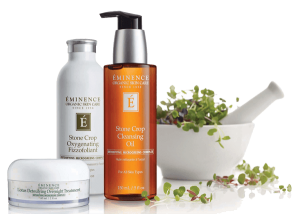 Since its founding in the late 1950s, Éminence has used sustainable farming and green practices to create natural, organic and biodynamic products that are free of parabens, animal byproducts, propylene glycol, sodium lauryl sulfates, harmful colorants and fragrances, mineral oils, petroleum, and other harsh cosmetic chemicals. The company continues to use hand-picked and hand-mixed ingredients to create products that contain potent healing and beautifying properties. Many of these ingredients are combined with pure waters from a thermal hot spring lake, containing minerals and trace elements found nowhere else on earth. The products are handmade without any severe heating or hydrogenating processes that can affect the nutritional content and potency of natural ingredients. Vitamins are captured in their all-natural fresh base, offering the dramatic results as seeds, pulps and peels impart regenerative and healing powers that only nature can produce. Founded in France more than 40 years ago by chemist René Guinot. The collection of exclusive skin care products known as “Guinot Paris” began as a focused approach to treating the skin with the now legendary Hydradermie treatment used in spas. Guinot developed treatment-compatible products that could be used by clients at home. Today, Guinot Paris skin care products and professional treatments are available in thousands of spas and salons around the world. 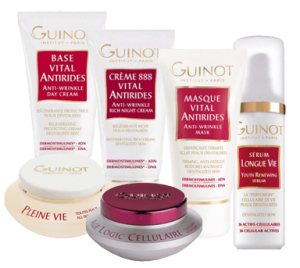 Guinot Paris provides a wide range of beauty care for the face and body, and protection from the sun. The company’s philosophy of professional expertise as a guide to how to use the products is an important part of the skin care message. Fundamental to this is the Guinot creed, which points out that every person’s skin is different and is exposed to distinct environmental and stressful conditions at different times. It is the synergy of professional services and skin care products that results in beautiful skin, for which Guinot Paris is renowned. Keeping its roots in the spas where its professional treatments began, Guinot Paris has increasingly expanded its retail operation. Today, it is recognized as a leading skin care collection, available exclusively at prestigious spas worldwide. Love the staff and great products. Amazing estheticians! Love their Éminence selection. Love the friendly, professional service! We love to keep in touch with the people who visit our spa. Sign up for our email list and be the first to hear about news, events, new products and special offers.